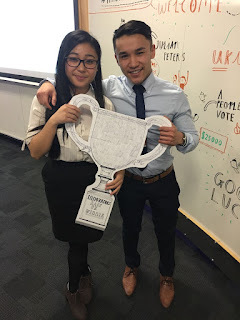 After winning the UK finals of Capgemini’s Innovators Race, Hertfordshire Business School students Trevor Yu and Fiona Huynh went through to the international round competing against students from Brazil, France, the Netherlands, India and the USA. The Innovators Race is a competition which requires competitors to come up with solutions to a real business challenge set by a national business. 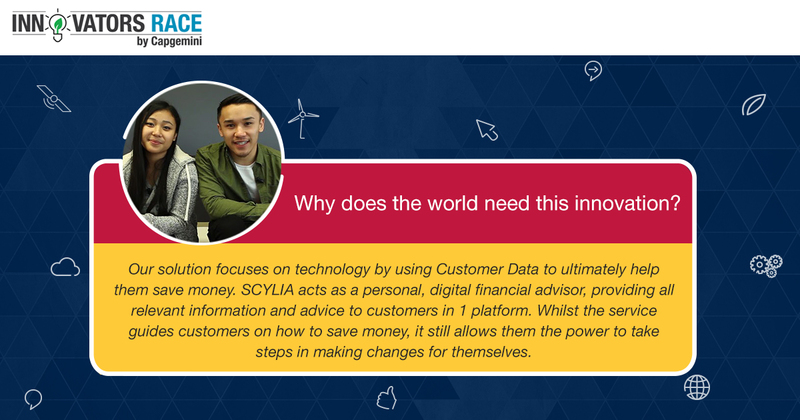 Trevor and Fiona were tasked by Barclays to find a way to improve customer and client experience using innovative and emerging technologies. Unfortunately Team Rainbow narrowly missed out to France in the International voting round however we caught up with Fiona and Trevor to get a deeper understanding of their own innovative idea and how the competition had been for them. What made you apply for this competition? Trevor: I wasn't aware of the competition until Fiona approached me and asked if I would like to join in the race as a team of two. Fiona: Last year I competed in the University Business Challenge, where I recruited and lead a team to successfully progress to the semi-finals. My team and I also were the first representing Hertfordshire Business School to progress to this stage, which made the achievement even more striking! Ever since that adventure, I have sought after competitive events, which led me to pursue the innovation and technology influenced Innovators Race. What’s the innovative idea and how did you come up with it? Trevor: We broke down the brief and tried to identify a solution that would help Barclays’ customers and clients achieve their ambitions using emerging innovative technology. We found that customer demand was for information based on their financial lives and that by using the personal details and spending patterns of Barclays’ customers, we could create a personal platform to help them meet their saving goals. Fiona: I've always been interested in the technology industry and I try to keep up-to-date with the latest gadgets and computing skills, one of which is data interpretation. So when we thought about this, we began thinking more innovatively about how we could develop a personalised service. Our solution then, was to create a service tailored to customers based on their specific user profile, which we named ‘Scylia’. What was it like presenting your solution during the UK finals? Trevor: It was overwhelming. We had spent a lot of time in the preparation stage so I was confident that whatever happened we had tried our best. On the day, the eighteen finalists were split into three groups to present our ideas to senior officers from Capgemini. We received some great feedback afterwards and we were excited to hear that we were the best pairing in our group. Then Fiona and I and the two other teams had five minutes to prepare for a two minute elevator pitch in front of all the teams, senior officers, and Barclays CTO - Michael Harte, which was over forty people. I can only thank the presentations I had done during first and second year, which prepared me to present confidently and professionally in front of a big audience. Fiona: Intense! The competition was fierce, and with Barclay's CTO and senior members of Capgemini judging us, the pressure was definitely on! Nevertheless, through all the hard work we put into the presentation, we managed to impress. How did it feel to get through to the International round? Fiona: It felt surreal! I was confident in our team, but I still couldn't believe it when they called our names. To get this far in such a big competition is definitely overwhelming. Trevor: Fiona and I felt it was very close between us and the other two UK finalists, as their ideas were great. I felt proud of what we had achieved so far and being able to win showed that the hard work and time spent preparing for the UK Finals, had paid off. Winning the UK Finals and now representing the UK is a real achievement. Not only because it will improve my own skillset, but I believe it will also open doors for us in the future. What has this stage of the competition been like for you both? Trevor: It has been difficult to balance placement work and the competition work, so we’ve had to use our holidays to work with Capgemini, but it has been a welcome sacrifice. The Innovators Race has been a great experience so far and we’ve been rewarded the opportunity to meet incredible people, go inside the Barclays office at Canary Wharf and even become actors for 3 days. Fiona: This stage required more effort and hours invested than expected as trying to get from our initial idea to reality was very tough! However, it has been a valuable learning curve and a fun competition, full of networking and meeting lots of new people!